Spring is usually a good time for a refresh. And that's what's happened at Stone & Wood. They've taken their Lager – their second biggest-selling beer – and given it a makeover. It's one that starts on the surface, with the bottles switching from green to brown (which provides better protection against "skunking" by light) and continues inside with the packaged beer now to be the same one you may have had on tap: unfiltered. 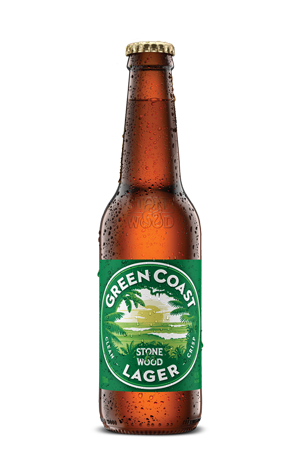 The new beer has a new name too; just as the likes of Jasper and Pacific were chosen to conjure a feeling for the place in which they are brewed, the Lager is now Green Coast. Otherwise, however, it's been left as is: a malt-driven, European style lager with soft, herbal hops wafting by like a gentle sea breeze – hello, Pseuds Corner – over soft, slightly sweet, grainy malts and just the faintest hint of bitterness.